Have you been dreaming of sitting around a campfire, enjoying the company of good friends and a stunning view of the stars? That campfire feeling doesn’t have to be reserved for the occasional camping trip anymore. You can enjoy the crackle of wood, the warmth of the flickering flame, and the pleasures of friendly conversation around a custom outdoor fire pit in your own backyard. Archadeck of Raleigh, Durham and the Greater Triangle can build your new outdoor fire pit on your deck or patio, using materials that are sure to meet your needs and personal style. 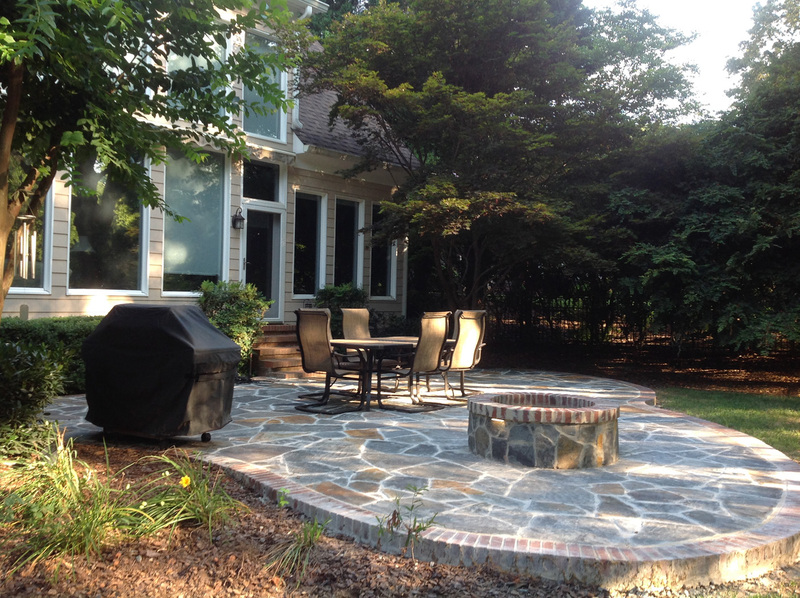 The most common location for a Raleigh outdoor firepit is on a concrete, stone, or paver patio. Being at ground level and on a fire-resistant surface gives most people the greatest peace of mind for enjoying an outdoor fire close to home. You can also choose an in-ground firepit to create the closest campfire feeling. There are also many beautiful design options for creating a patio fire feature. You can highlight the fire pit as a focal point using a custom inlay in the paver patio design. The fire pit area can also be visually and physically defined using retaining walls of the same or a complementary material as the patio. Retaining walls can also serve a functional purpose, such as providing extra seating or dry storage space. Although patios are popular locations for firepits, did you know you can have a fire pit on your deck as well? Placement, flow, and seating are important considerations for a deck-top fire pit. For fire safety, you want to be sure not to place your fire pit too close to the home or other parts of the deck structure, such as the railing. 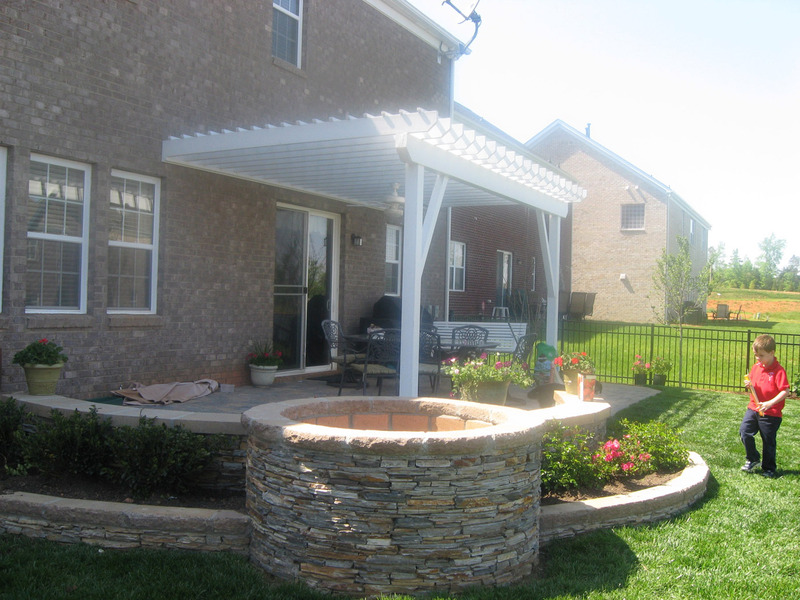 You also don’t want anything hanging overhead, such as a pergola or eave. Flow is an important consideration for safety as well as enjoyment. You don’t want to place the fire pit in a high traffic area, such as the top of stairs. And just as with a patio layout, you want to make sure you have enough space for comfortable seating on a deck as well. What fun is a fire pit if you don’t have enough space to gather around it? 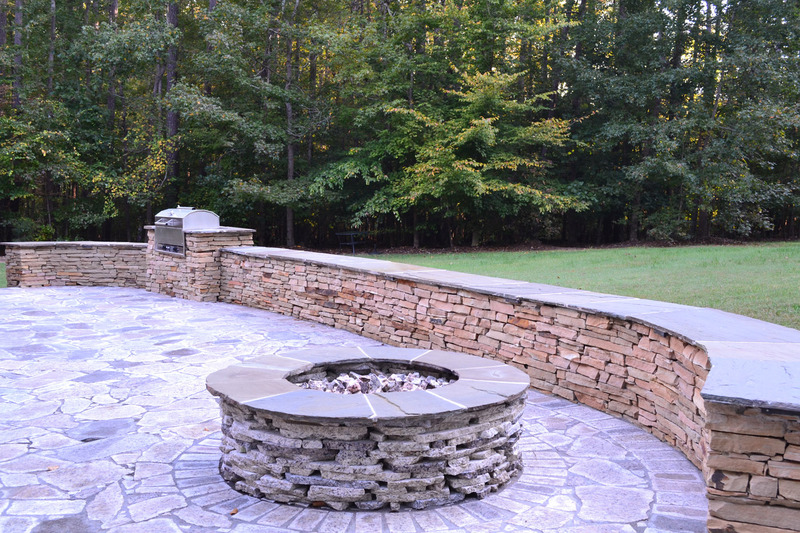 When building an outdoor fire pit on your Raleigh area deck or patio, choosing between gas and wood burning fire pits is a key decision point. While the sizzle and smell of a wood campfire are enjoyable, you may choose gas for convenience or added safety. An easy flip of a switch can have your flames dancing in seconds and extinguished just as swiftly. And without sparks or embers being dispersed by the wind, the safety of a gas fire pit far exceeds the variable factors of a wood fire. No matter where they are placed, or what type of fuel you use, fire pits can be round or square, deep or shallow, small or large. There are many material options to choose from, such as stacked natural stone, stone veneers, recycled granite, flagstone, brick pavers, pre-fab stone, limestone, bluestone and many more. You can choose one material or mix-and-match for a more striking design. If you choose a gas-fueled fire pit, you’ll also have a variety of material choices for your filler, from lava rock to glass to fireproof river rock. Modular, pre-made fire pit kits are also available as a lower-cost option, but they are more limited in their design choices. Archadeck of Raleigh Durham’s professional design service will help you identify the perfect design and materials to meet your needs and complement your existing outdoor space and home design. If you’d love to enjoy a campfire any day of the week, call today for a design consultation. 919-973-1523 Make sure to visit our outdoor fire pit gallery for design ideas and inspiration as well. We look forward to working with you!